Subject: Re: Help finding a hinge please. Help finding a hinge please. I need to find some sort of rear mounted cabinet hinges with no to minimal face exposure for the doors in the attached drawing. These are inset doors but do not have the standard 3/8" x 3/8" edge rabbet detail. Anyone have any ideas? Or perhaps it doesn't exist. What would happen if you tried using blums half-cranked special application hinge. 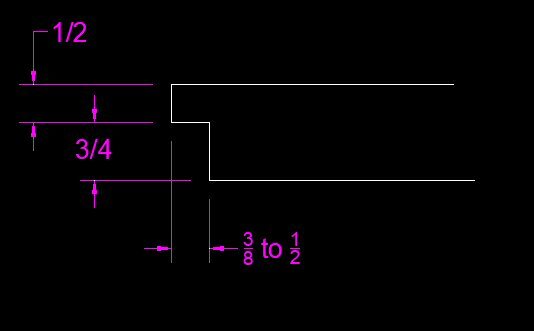 Maybe change the boring distance and hinge plate setback? Just throwing it out there. Thanks Eddie. That's exactly the type of suggestion I was hoping to receive. Salice makes a different articulating hinge that does odd things. I used them on a similar rebated door 15 years ago. Adam is correct. 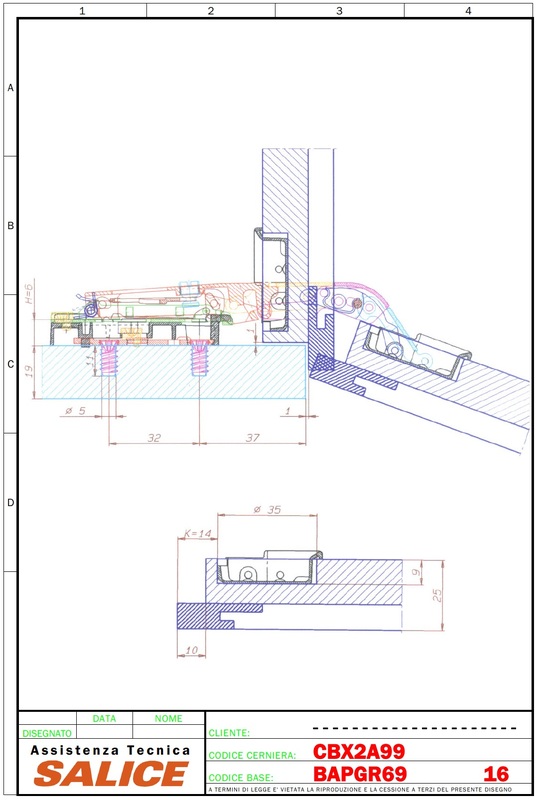 We do indeed have a hinge specifically designed for this application. This is the B Series hinge for profile edge doors. Your local distributor should have them in stock. Here is a copy of our catalog page showing this and an example of an application similar to yours. I realized after the fact that I neglected to mention this is a face frame situation. Does that make it a dead end for using your hinge? You're not at a dead end yet if you are able to block our behind the face frame flush then hinge the door like a frameless cabinet. That probably isn't going to fly as some of the doors hinge to a center vertical stile. I don't think adding a vertical backup board the same width of that stile is going to be acceptable........but I'll check it out. I think Rockler still makes a mounting plate that you dont have to block out flush for but they are very expensive. I always wondered why Salice did not make a plate like this?? Dennis?.. Can you use a hospital tip hinge with the barrel exposed? I did think about that rear-mount face frame hinge but the ones I'd seen were even bigger than the one at the link below. And it turns out it is a Salice hinge/base setup.....at least this one. Dennis.........do you think that would work with the larger edge rabbet ? Pat.......thanks for the hospital tip hinge suggestion. Perhaps I'm not finding the right thing but it looks like you need a full inset / flush door for those. That is what is in place now and the owner wants to go to the 3/8" inset look. I've figured out how to pull this off IF the owner is willing to compromise somewhat. 1) Youngdale hinge if they are willing to have a 5/8" thick exposed door edge instead of the typical 3/8" thick edge. 2) Not really what they were looking for but a full overlay if they are willing to have a 1" thick square door edge. Both these IF options are dependent upon the amount of existing counter overhang above these cabinet doors. I'll be checking with them on that. I've been away from my computer for a few days. 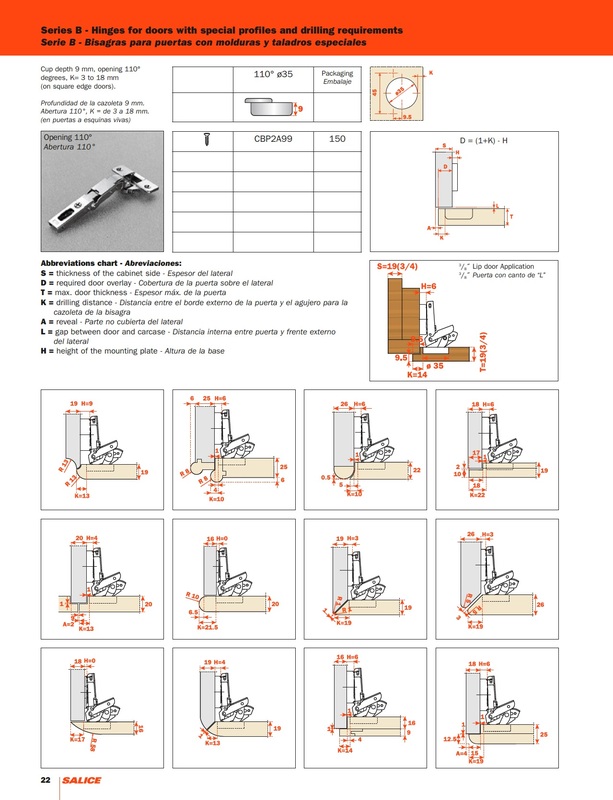 Regarding the Rockler platform, they have that piece made exclusively for them and only sell it as part of a kit that includes our B series hinge and a 6mm mounting plate. We did look at producing this but the quantities to produce this efficiently are too large compared to the possible number of customers who would be using it. We simply suggest building the side flush with the frame. Question #2: Larger end rabbet? I don't think that would help. It's not the rabbet that is an issue. Thanks for the photo. Now that I see it I recall that I have run into those in the past. I saw the owner over the weekend and have been given the go ahead to do whatever is needed. That resolves the problem as I can now work out a plan that uses standard face frame hidden hinges.